Formed in London, Ontario in 1976 as Cheeseburger Deluxe, this band made a name for themselves on the Ontario bar circuit as a great cover band. 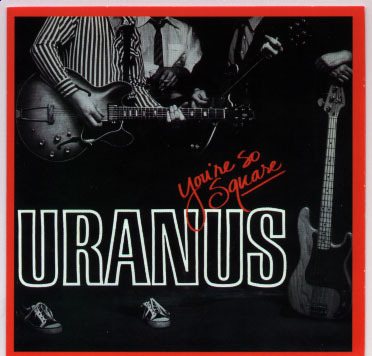 Towards the end of the 70’s they changed their name to Uranus (tongue in cheek ! ), and recorded an independent single , the fifties styled rock and roll song “You’re So Square” for the Trilogy label. That single proved to be successful and lead to a full album of songs. You’re So Square the album, also on Trilogy, was recorded in Toronto and released in 1980. The album was produced by Ross Munro and featured mostly new wave styled covers of 60’s and 70’s hit songs written by the likes of: The Rolling Stones, Buddy Holly and Bob Dylan. The album also featured four original tunes, including the hit single, and the hilarious spoof of the band arranged, ‘Ballad Of Gilligan’s Island’. With the release of the album, Uranus became quite popular in western Canada and embarked on a tour of the west. When the band completed the tour and after less than successful sales of the album and the realization they would essentially remain nothing more a great cover band, Uranus broke up leaving the legacy of only one album. This release by Unidisc Records, is a straight reissue of the original Trilogy Records album at a budget price complete with original artwork.